I hope you all had a wonderful Thanksgiving with family and friends. Now that Thanksgiving’s behind us – let’s focus our attention on Christmas! Think about it, Jesus followers get all excited about the resurrection of Jesus Christ – and rightly so – but without the birth of Jesus Christ, there is no resurrection! Christmas is where it all began, it’s the fuse that ignited the explosion of life over death! It deserves more attention, better teaching, and life changing application. Sunday, December 23 at 9 and 10:45 a.m.
Monday, December 24 at 3 and 4:30 p.m. This will be a great series to invite your friends and family to come with you to church. The first message will be an eye-opener as we unfold the truth of when Christmas literally began. And by the way, you’ll be surprised by the launching date of Christmas – I can pretty much guarantee it’s not what you’re thinking. It’s an unbelievable story. Mary conceiving a child, as a virgin… come on… really? But when we unfold the whole story from its very beginning, the remarkable will be more believable. 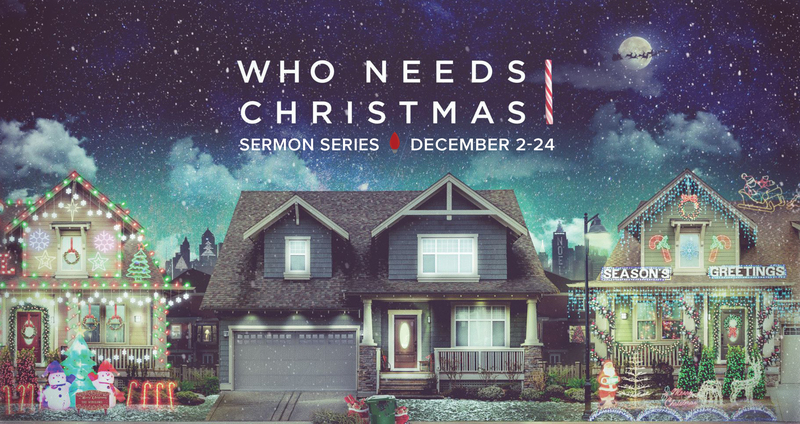 The second message will be a paradigm shift as we will look at Christmas from God’s point of view. This message will give a perspective that we rarely consider. Once we hear and receive the message it will leave us thinking outside the box, taking us into a space of deep appreciation and gratitude. The third message will reveal the meaning of Christmas. Defining it as more of a battle than a day for eating peanut brittle around the tree; more of a conquest than cookies and caroling. I don’t want to say too much more about third and fourth messages because the content of the last two messages are lethal. There you have it, a thirty-thousand foot, flyby view of our “Who Needs Christmas” series! Hang on and bring a friend to church for this explosive series.